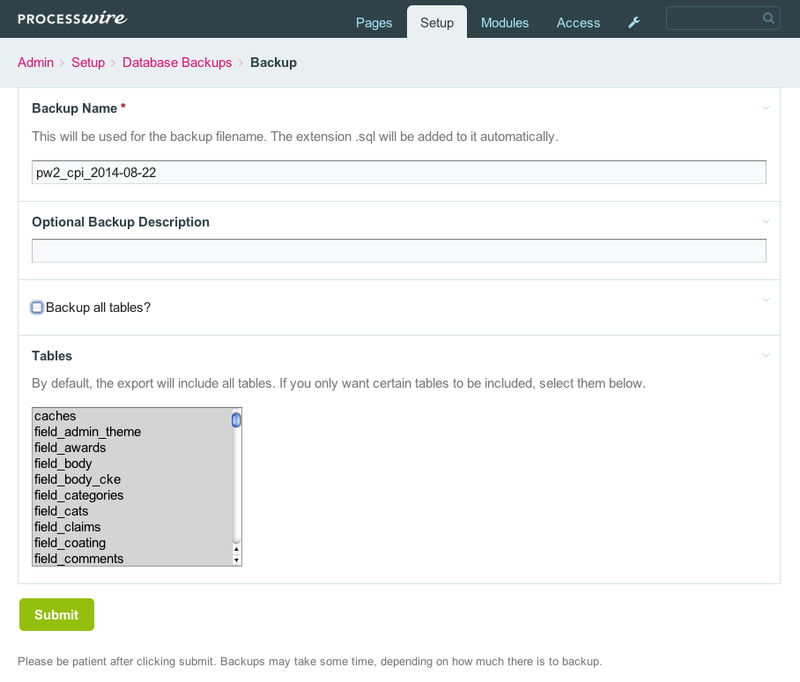 Both the backup() and restore() methods also accept several options for limiting the backup to certain tables, adding annotations and more. 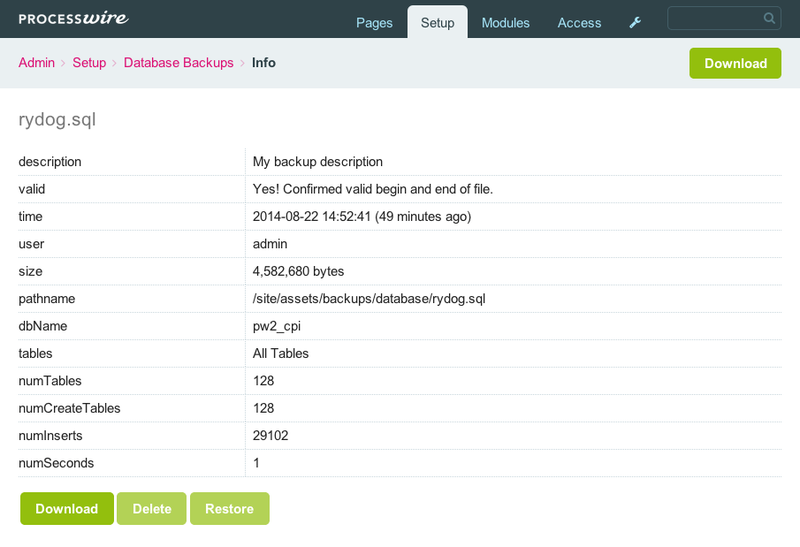 For details, see backup options and restore options. Plans for the WireDatabaseBackup class are for it to be used by our main installer. It will also provide future backup options before making changes to fields, templates or modules, so that you have undo capability. A future automated upgrade utility for the core will also be using the backups function. Please note that the restore function is only designed to restore backups created by the backup function. While it may also work with other SQL dump files, don't assume it will work. Make sure you have a good "backup" when experimenting with these new functions, as these are brand new and not widely tested just yet. All interactive modules that run in the ProcessWire admin extend the base Process class. We've added some new capabilities to that class to make development of Process modules even simpler. Now you can call $this->headline("Your Headline"); in your Process module to set the headline, and $this->breadcrumb("path", "Label"); to add an item to the breadcrumb trail. However, usage is of course optional. The base Process class now adds these things for you automatically where appropriate. So you only need to set the breadcrumbs or headline if you find that you want to vary from what the base Process class has automated for you. Incidentally, you could set the headline and breadcrumbs relatively easily before, but the code to do it was just plain ugly, and these new methods are a lot cleaner and easier to remember. Note that page property above. It is an array containing the name of the page you want to create, and the parent page where it should live. In this case, this Hello World module will be added below the Setup page, since we've specified "setup" as the parent (which is the page name). The parent may also be omitted, in which case the page will be added with admin root as parent. You can also specify a title property if you want to here. If omitted the module title is used instead. When you specify this page property in your module information like above, that page will be created automatically (at installation time) and your Process module will be assigned to it. When/if the module is uninstalled, the page will be automatically trashed. The above module information also demonstrates a few other recently added properties (mentioned in previous core notes), including icon and permissions. 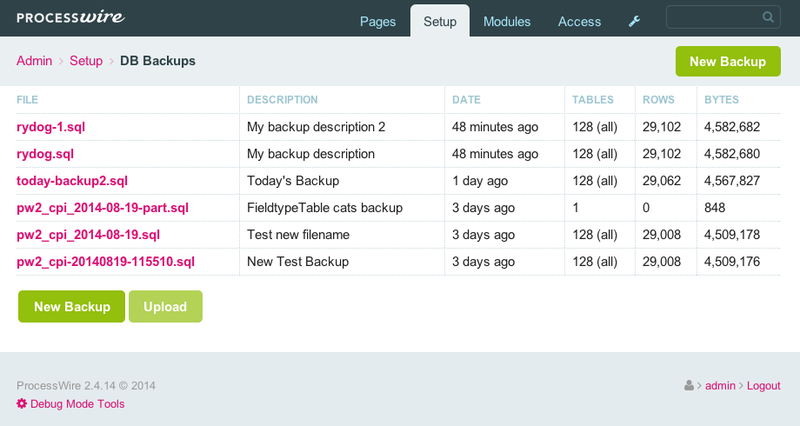 This is a new module that brings the backups capabilty (mentioned earlier) into an interactive Process module. If you are running the latest dev branch, you can install this module directly by zip file or by grabbing it on GitHub. While this module is not currently part of the core, we will add it if there is demand for it. Otherwise it will be added to the modules directory once ProcessWire 2.5 is released. This module is a work in progress, and there's still more to add. But we hope you find it useful. Consider it very much a beta test module at the moment, so don't make it your main backup/restore solution just yet. Just a quick thought on the tables to include part of this module. As all tables are included by default, could the select be changed to select those that you do not wish to include, as that is most likely a smaller selection. For example select 'caches' to be excluded. Also, it would be good I think to have 2 selects, one for tables to exclude completely and one to select tables whose data should be excluded, but still keeping the table (TRUNCATE). Going to post this in the forums, and downloading now for a more in depth look. Thanks for this, it will be a great addition to Processwire.